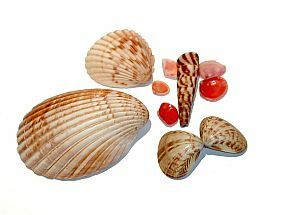 People often collect seashells from the beach and forget about them, but if you make candles out of the shells, you’ll have an attractive and romantic centerpiece. All you need is shells (the deeper the better), candle wax, a glue gun and wicks. Make sure that the shells you’re using for candles don’t have any cracks or holes! Then glue your wicks down with a bit of wax or glue, melt the wax and pour it into the seashells. The nice thing about these is that the seashells can be reused to make new candles. Different sizes and colors look beautiful together and add extra ambiance to any room. Martha Stewart shared a great tip about gluing shell feet onto the tipsy shells so that they’ll stand up straight. It looks cute too! For more great tips, see Simple Mama’s post at the Homemade Serenity blog called Why Don’t You Make Seashell Candles.